We live in the uncertain times of suspicion, mistrust and excessive consumerism. What can be done? Is there a solution? Is there an avenue where we can learn to share, trust and connect again? 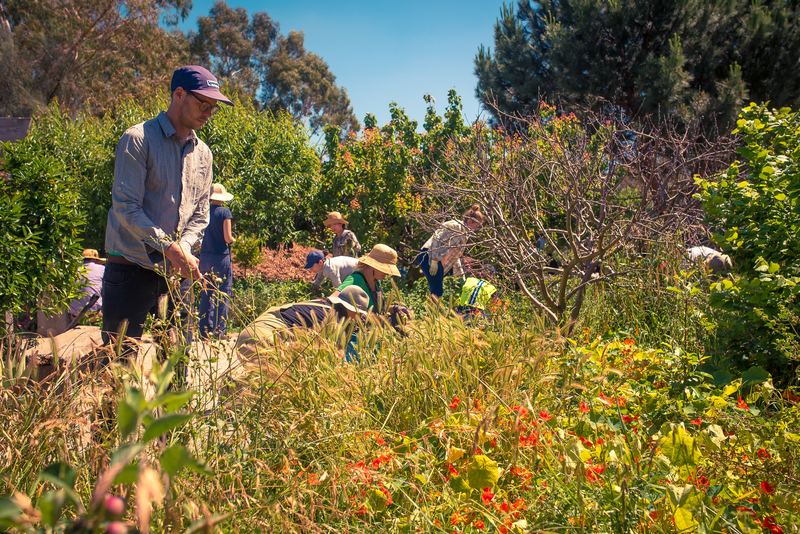 Nearly every weekend in an ordinary Melbourne backyard you can be fed, given free seedlings for your own garden and learn new valuable life skills whilst doing muscle building workout in the fresh air. But it does not stop there. These gatherings also include inspiring discussions and some food for thought. A vegan will devour a locally sourced home made salami (thanks Sandra!) and a convicted meat eater wolf down vego food to the last chick pea and contemplate on a life of a flexitarian. This is a story of Juan. The story is quite typical. A self confessed city boy moves to a Northside property with a green lawn/wasteland of a backyard and experiences a reawakening of the genetic memory of his grandparents’ farm. Blitzing for young and old! On this typical sunny Melbourne morning, he finds himself at Brunswick West Food Forest. 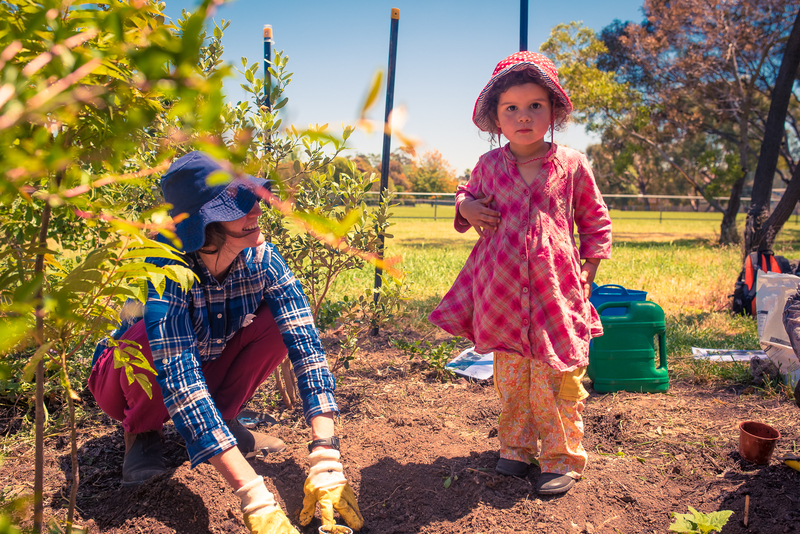 The Food Forest is a beautiful community initiative and a great example of what can be achieved in only three years. Spreading of 6m3 of mulch (cardio and biceps building). Broadcasting of hundreds of kilos of gypsum and soil wetter (more cardio). Innumerable buckets of molasses mix (isometric exercise – great for muscle toning). Planting of dozens of plants (just plain calorie burning). And, of course, many square metres of weeding (good for you and your plants). I’m sure I can reach that apricot! Use gypsum to help with the breake down of the clay in the soil. 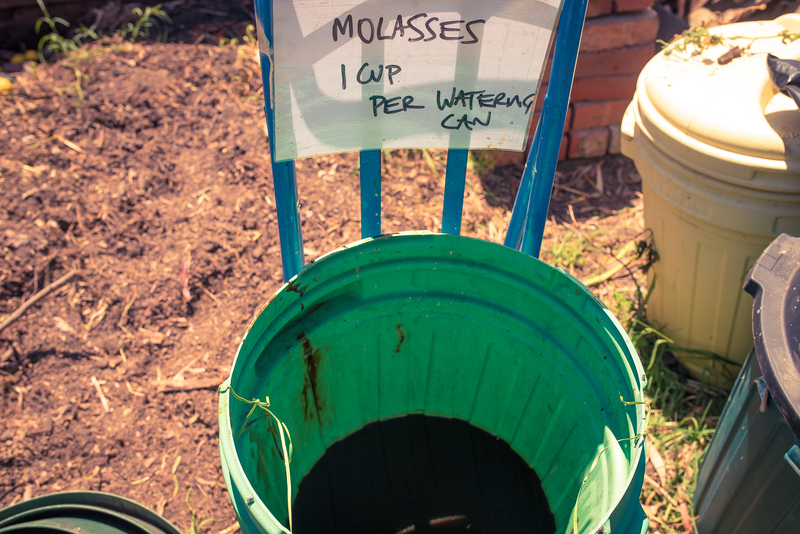 Molasses mixed with water is great for improvement of microbial activity. It’s full of sweetness and a range of minerals. 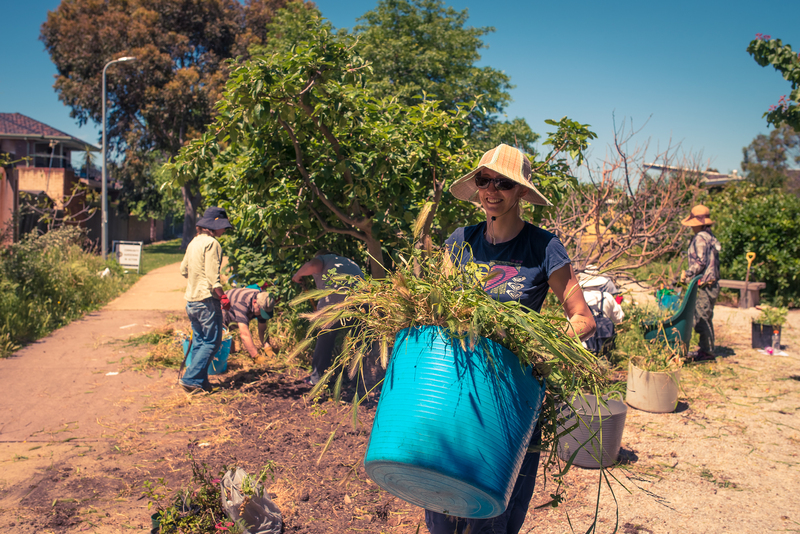 Don’t forget to feed your plants during their fruiting season with compost and weed tea! Weed tea is created by killing your weeds by drowning them a bucket of water. In several weeks, once they are dead and harmless put the debris in compost and use the remaining water as a liquid fertiliser after diluting it. Remember, don’t use on the plants without diluting first. 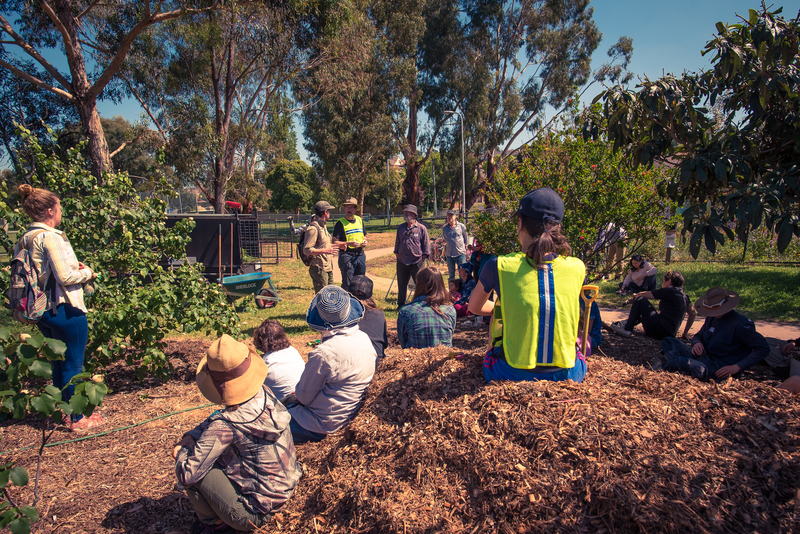 So do yourself a favour, and visit Mark and his crew at the newly blitzed Brunswick West Food Forest! What an awesome bunch of people! As for Juan, he has planted his freebie plants, has recruited one of the flatmates to share responsibility of the care of the growing vegie patch and is ready for the next blitz in Richmond. 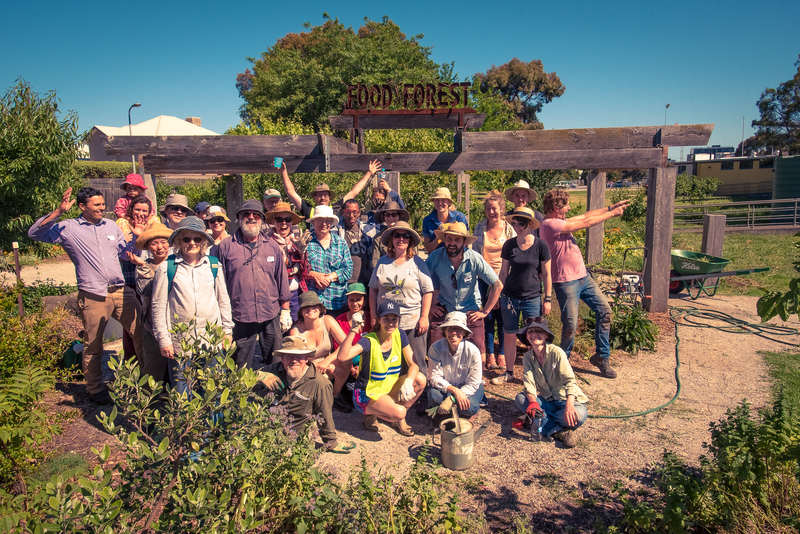 If you’d like to get involved with the ongoing development and care of this amazing place there are regular Food Forest get-togethers on the 3rd Saturday of every month. Obviously there’s also the community garden available too. 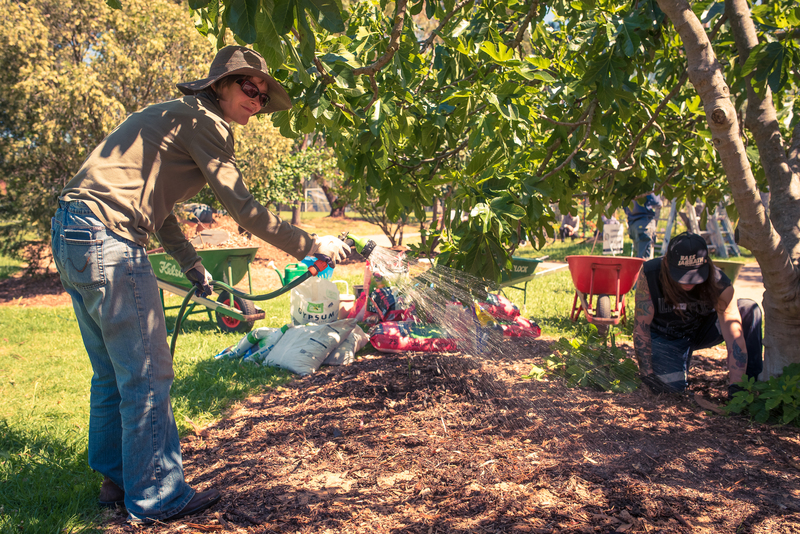 You can find out more about both of these as well as the Moreland Community Gardening group. 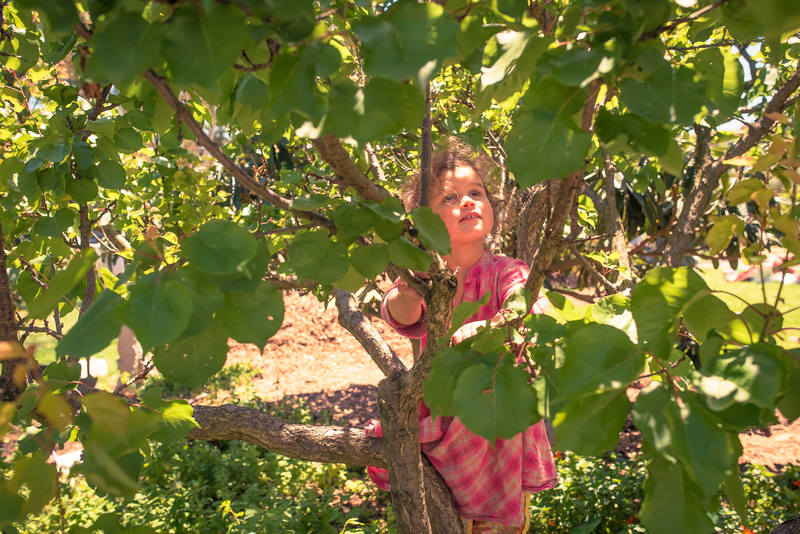 Sign up here to become a member or just to receive our newsletters with news and events for both the Food Forest and the Community Garden. You can also like them on Facebook (but the newsletter is where it’s really at). You can check out the full gallery here. All pics taken by the talented Juan Maralunda.